Four months on the Spiegel Best Seller list of Germany (equivalent to the New York Times' Best Seller list in the USA), I Sleep in Hitler's Room is a Jewish story, told the way Jewish stories are told: with biting humor. On the face of it, this book is a travelogue, a journal by a Jew from New York traveling in today's Germany. A very funny story indeed. But this is just part of the story, the smallest part of it. For I Sleep in Hitlers Room is also a book about modern anti-Semitism, about hate that refuses to disappear, about a disease that wont get cured and a curse that wont let go. Traveling across Germany and seeking out that elusive quality that is the German character, playwright and journalist Tuvia Tenenbom wonders whether he has identified it in any one of several striking social phenomena the proclivity of Germans to join clubs and group activities; how their aptitude for visual design shapes their architecture and their daily life; how their daily life is suffused with soccer and beer, the omnipresent beverage for all occasions; how they proudly self-define themselves by their achievements in precision technology; and, what is most disturbing to this son of Holocaust survivors, how their crushing awareness of their dark history coexists with virulent anti-Semitism and a stubborn obsession with Israel. Why is Europe, the cradle of our civilization, so obsessed with Jews? Read this book to find the answer. Tenenbom integrates deep seriousness with the most lighthearted comic touch in this critical but affectionate look at both left and right in contemporary German politics and society. 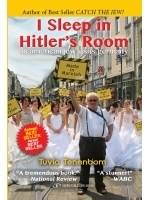 I Sleep in Hitlers Room will make you think, make you worry, make you cry, and make you laugh out loud. It is a book you will never forget. Ever.